Late spring of 2018 has been quite the saguaro flower show in our Sonoran Desert. Our big cactus out front has had many and will have many more flowers opening. Main pollinators are honey bees, bats, and white-winged doves. In most years, diurnal visitors are the main contributors for fruit, most of them honey bees. Other diurnal pollinators are birds such as Costa’s hummingbird, the black-chinned hummingbird, the broad-billed hummingbird, the hooded oriole, Scott’s oriole, the Gila woodpecker, the gilded flicker, the verdin, and the house finch. We have enjoyed the “Bumper Crop” of flowers this year. Click on the image to enlarge. 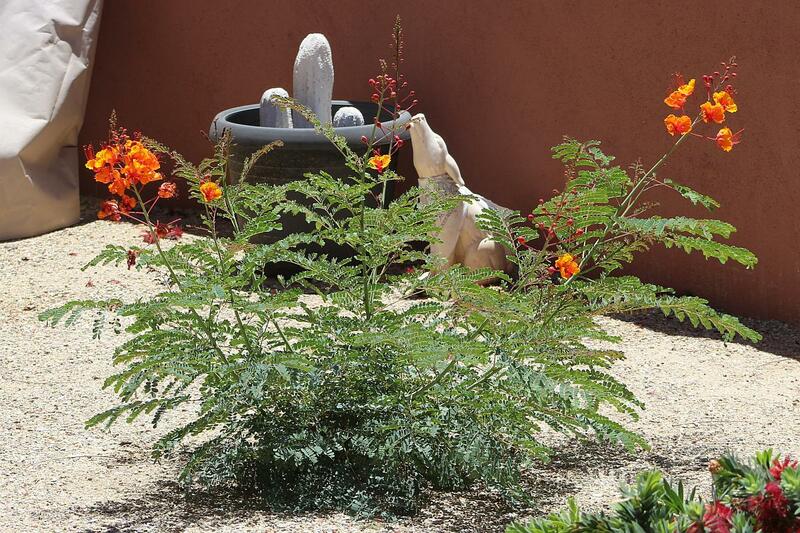 It’s late spring and the Red Bird of Paradise colors are coming back to the courtyard. 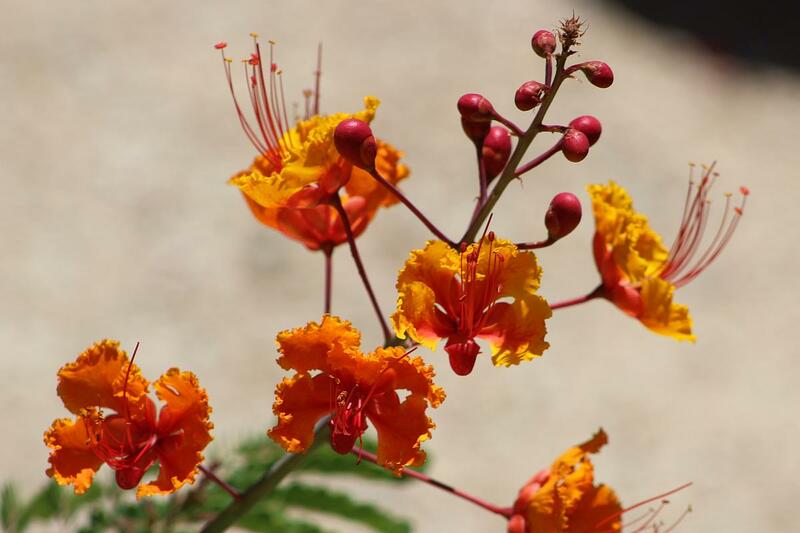 A.k.a Pride of Barbados, our Caesalpinia pulcherrima shrubs are beginning to show their summer colors of red, orange and yellow. Flowers are currently open on the western most shrub but with others rapidly forming on the other two shrubs in the courtyard. Click on either image to enlarge. We have been fortunate to have had spring-like weather since mid-January. 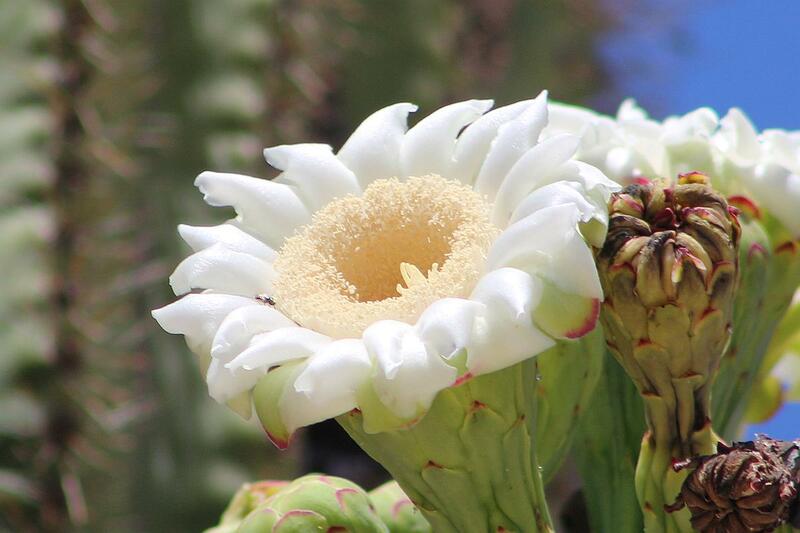 The cactus flowers are blooming and the desert critters are out and about acting as though it were spring. 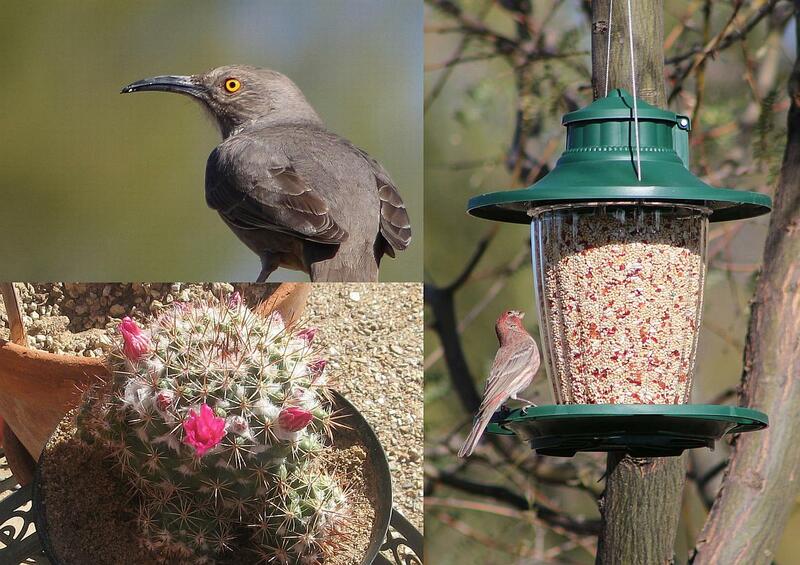 In the composite photo above, a curve billed thrasher looks around while sitting atop one of the bird feeders, a courtyard cactus is having many flowers and a house finch is trying out the new bird feeder in the mesquite tree in the back yard. Moving to Arizona was one of the best things we’ve ever done. Click on the image to enlarge. As the summer season winds to a close, the Red Bird of Paradise Flowers continue to attract hummingbirds, bees and butterflies. 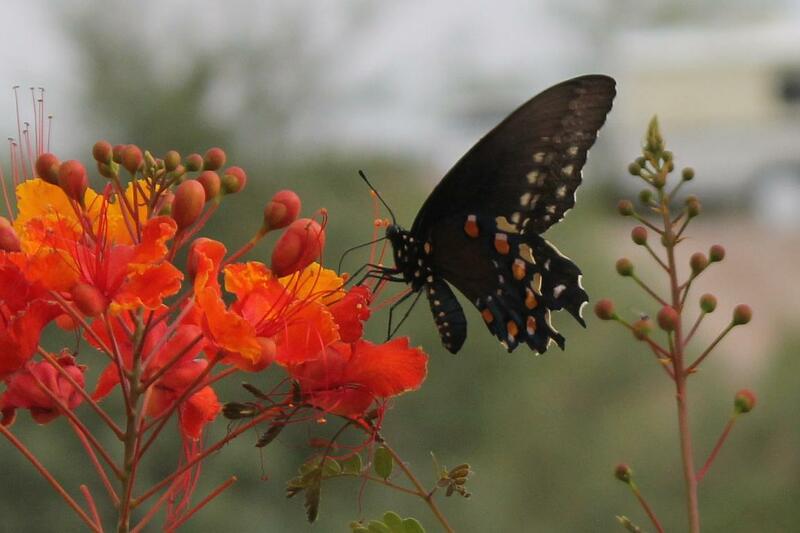 I captured this lovely black butterfly in my camera as the little critter lit on one of the flowers in the courtyard. 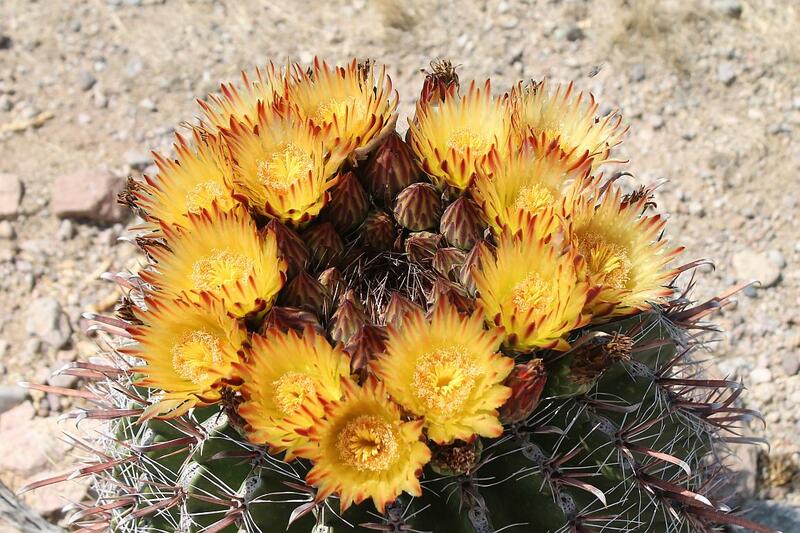 When we got back from our three-week vacation, we discovered that the Devil’s Tongue Barrel Cactus was covered with flowers and buds. It is sure to put on a good show as second spring arrives in our part of Arizona. 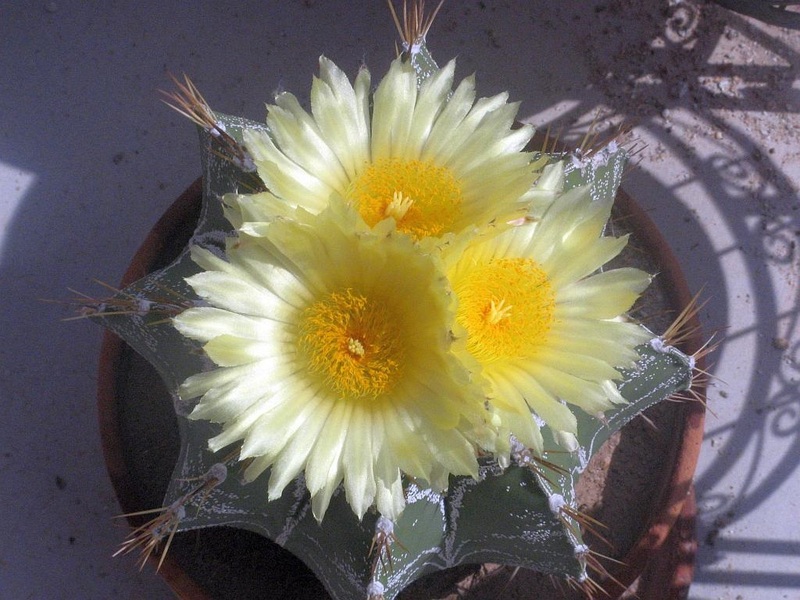 This cactus was in a pot when we lived in California, but now it is in the ground in my rock and cactus garden. It sure seems happy to be in the Arizona Desert! About a month ago, this Astrophytum was in bloom. Yesterday and today, it has open flowers again. This cactus seems to have flowers several times a year like our Bishop’s Cap Cactus. The latter, unfortunately, has not had flowers this year. We have had that cactus for almost twenty years and maybe it’s through with flowers. 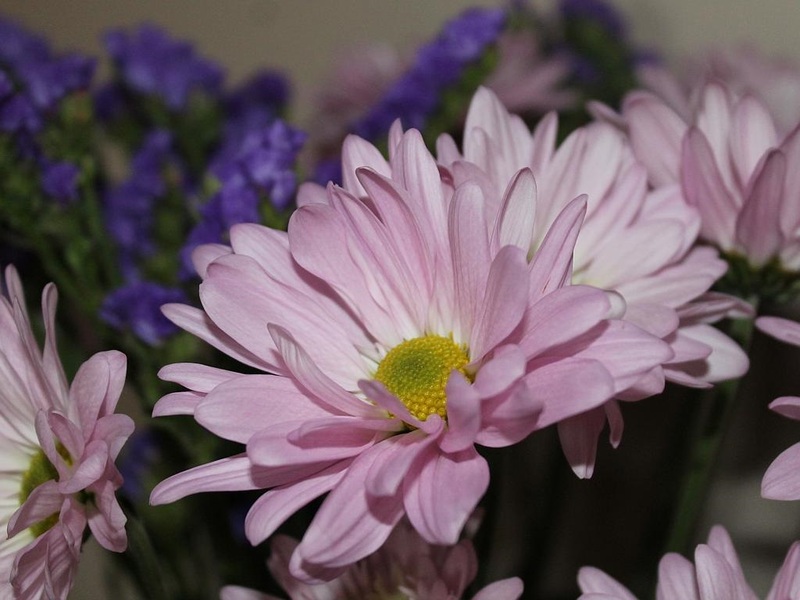 This week we bought a bunch of cut pink daisies for the vase along with some purple flowers whose name we don’t know. The colors went well with each other, so I didn’t really care about what they were called. The flower concession used to label their flowers but lately they have only been stamping them as “cut flowers, monochromatic.” Regardless, we love to have flowers no matter if we know what they are or not.